Valerie Prilop, Digital Collections Librarian at the UH Libraries Special Collections, earned a DAS Certificate from the Society of American Archivists. 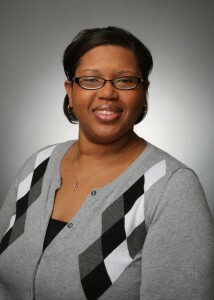 Valerie Prilop is one of 33 new Digital Archives Specialists (DAS). Prilop, digital collections librarian at the University of Houston Libraries Special Collections, earned a DAS Certificate from the Society of American Archivists (SAA) after completion of coursework on the theories, problems and solutions in the management of born-digital records. The DAS curriculum provides participants with the skills and knowledge necessary to address issues in the appraisal, preservation and access of materials originally created in digital format. Although the management of born-digital materials in academic and research libraries is still largely nascent, it has become an urgent concern for institutional repositories, such as UH Special Collections, which are receiving more and more archival items in digital format. 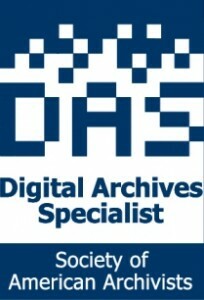 Born-digital archival materials have a unique set of preservation and access issues. Digital records are fragile and will degrade much more quickly than paper documents, which are stored in climate-controlled stacks within acid-free containers and can be preserved for hundreds of years. “You could discover a file drawer of 75-year-old paper, and in a lot of instances, you can still read the content,” Prilop said. The same isn’t true for digital files. “Time is of the essence when dealing with born-digital materials,” Prilop noted. The evolution of technology dictates ongoing software and hardware changes, and access to digital files on older versions of technology, such as a floppy disk or zip disk, could be lost to the ages without expeditious archival processing. Prilop is developing a comprehensive survey of UH Special Collections audio/visual and digital materials, which will inform a future processing plan for those materials. Other ongoing born-digital efforts at UH Libraries include the efficient accessioning and storage process developed for digital University Archives material; and provision of reading room access to born-digital materials in Special Collections. Mary Manning (’98), university archivist, has been appointed by the ArchivesSpace Board of Trustees to its User Advisory Council for a two-year term. ArchivesSpace, a new open source archives information management application, was developed by archivists for describing, managing, and providing access to archives, manuscripts, and digital objects. ArchivesSpace, a new open source archives information management application, was developed by archivists for describing, managing, and providing access to archives, manuscripts, and digital objects. ArchivesSpace will soon be widely adopted for use by archives across the country, replacing Archon and Archivists’ Toolkit as the leading application. Manning serves as one of 10 new appointees who will shape software functionality enhancements and ensure that ongoing development represents the needs of the ArchivesSpace community. “It will be the Council’s job to make sure that the voice of all the ArchivesSpace members are heard when making decisions to improve the application,” she said. As a proud charter member of ArchivesSpace, UH Special Collections joins a group of over 50 institutions which will spearhead the Governance Board, User Advisory Council and Technical Advisory Council. Charter members are granted primary access to early releases of migration tools, and will participate in the initial phases of development. Julie Grob, coordinator for digital projects and instruction, served on the Special Nominating Committee for the ArchivesSpace Board of Trustees. “The web-based aspect of ArchivesSpace makes it easy for us to deliver finding aids quickly to our users,” Grob said. An internal group is working to plan the timeline and migration, which is tentatively set for the spring semester. Patrons will be kept apprised of changes, and a seamless transition is anticipated. Matt Richardson, a new program manager in Special Collections, will be responsible for checking finding aids to ensure that records have migrated successfully, and will work with curators, UH Libraries Web Services, and the ArchivesSpace user community to promote a positive user experience. After the transition is complete, Richardson will manage finding aids and explore the ArchivesSpace accessioning tool as a potential method to record incoming collections. The mission of UH Special Collections is to preserve, safeguard, organize, and describe materials in our collecting areas, making them available for current and future generations. Special Collections supports the teaching and research activities of the University of Houston, and serves as a resource for the scholarly community and the general public. Services include reference, instruction, archival collections processing, book processing, digitization, collection development, exhibits, marketing, and outreach. Andrea Malone, foreign language and ethnic studies librarian at the University of Houston Libraries, has been chosen for the roster of Fulbright Specialists in library science by the Fulbright Scholar Program for a five-year term. Malone joins a distinguished list of U.S. scholars and professionals who are awarded grants to engage in short-term, collaborative projects at universities in over 140 countries. Her research focus will be matched with an overseas host institution, where she will work on a specified cross-national topic that aims to strengthen institutional development needs. Malone, a liaison librarian who provides collection development, instruction, outreach and research support to UH faculty in foreign languages and ethnic studies, said that being chosen as a Fulbright specialist is an honor. “It’s going to open opportunities that I’ve never had before,” Malone noted. She encourages library science colleagues to pursue the global opportunities that the Fulbright program offers. While the exact nature of her project is yet unknown, Malone seeks to investigate the intercultural landscape of academic information literacy. “I work closely with international students here,” Malone said. “I’d like to explore the different types of libraries they experience in their home countries.” Culture has a significant influence on the ways in which international students seek and use library resources, services and programs, and Malone aims to implement new strategies in meeting diverse learning and research needs. The Seventh Annual University of Houston Libraries Student Art Exhibition opens next week, featuring 30 selected works from rising UH artists. 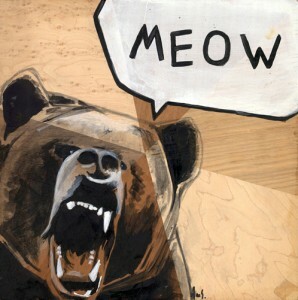 “Real Bears Go Meow” by UH student artist Alexander Santos. The Architecture and Art Library received over 90 submissions from a wide range of undergraduate, graduate and post-baccalaureate students enrolled in studio art, art history, architecture, media production, environmental design, applied math and biology, to name a few. “The exciting variety of contending pieces served as an appropriate reflection and representation of the staggering diversity that comprises the UH community,” said Chris Conway, Architecture and Art Library supervisor. Kathryn Kelley (MFA ’06), a regionally-based, multidisciplinary artist and instructor, graciously served as judge and curator of this year’s exhibition, which will be on display on the third floor of the M.D. Anderson Library. The opening event is Wednesday, February 12th at 3:00 p.m. The public is invited to experience this stunning collection of original artwork created by UH students, and to mingle with the artists and curator Kelley. The exhibition will be on display through April 25th. The University of Houston Libraries provides broad access to a wide variety of resources that aid in teaching, research and collaboration. One of those resources is the Digital Library, a comprehensive online environment that facilitates the discovery of unique digitized materials. 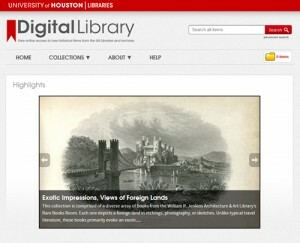 The Digital Library is a catalyst for collaboration among campus knowledge centers in order to collect, preserve and make available research and scholarship that is created or maintained by the University of Houston in digital form. The need for deeper access to archival collections and primary resources has expanded in recent years, and will continue to grow as more and more scholars and researchers seek materials in digital format. Visits to the UH Digital Library have increased from just over 41,000 to almost 89,000 between FY 2012 and 2013. Improved access, long term preservation, and efficient storage have emerged as ongoing issues to confront as more archival collections are digitized. To manage new and ongoing efforts in digital initiatives, UH Libraries has appointed a digitization operations librarian in the Metadata and Digitization Services department. Drew Krewer, an imaging and information professional with experience in the digitization of photographic archives and the management of digital objects, will coordinate with Special Collections and other units to manage digital projects from inception to completion, and will assist in the development of procedures and workflow for digital collections. Find digital collections of materials documenting the University of Houston, city of Houston, and state of Texas, as well as other historically and culturally significant materials, online at the University of Houston Digital Library.